The needs of stray or feral cats, whether one or a colony, are the same shelter, food, water and safety. For those taking care of a cat who just won’t or can’t make himself come into the house, here are some tips for making the cold weather a bit easier. A converted dog house, a bought shelter or a homemade one will all keep Kitty warmer, out of the rain, snow or ice and give him shelter from the wind. Small is good since heat can escape quickly. A box 2’ X 3’ in size and at least 18 inches tall is ideal. If caring for a colony, shelters with room for three or more cats will keep them all toasty warm during the night. For fewer cats, smaller shelters will need less body heat to keep everyone comfy. Other animals, like possums or raccoons, may be interested in spending the night. Keep the entry at about 6”– 8” in size to discourage unwelcome visitors. Modify dog houses to block off a large portion of the doorway. A plastic flap will keep out blowing rain or snow as well. A hinged top will give you easy access to change bedding or put in bowls of dry food. Keep moisture at bay with straw as insulation. Don’t use hay! Hay absorbs water, as do blankets or layers of newspaper, so once Kitty tracks in snow or muddy wet feet, hay, blankets and paper stay wet as Kitty stays uncomfortable. Change the straw when it’s dirty or wet and add more as needed for warmth. If you can’t check the shelters often, line the inside with Mylar or the silvery heat-retaining blankets victims are wrapped in after a disaster strikes. The shiny surface reflects back the escaped body heat and it’s safe for cats to lie on. Elevate the shelter to keep the cold and wet from seeping in from the ground. A base made from a wooden pallet will be a big help and will stabilize the house as cats settle in and rearrange themselves for the night. Shelters don’t need to be expensive to make. Ask home supply stores for scrap lumber. Not handy? Have a shelter-building party and invite friends. It’s a good way to educate others about the plight of feral cats. Not all people want to see your cat shelter; not all people are cat lovers. If this is your situation, take care that your cat shelter is not visible from the streets or other common areas. Perhaps hide it behind foliage or bushes. And if even a simple cat shelter is not possible, then simply place straw near/under a bush. Place two shelters face to face, with about two feet of space between. Secure a board across the top of both to create a dry space below. Food and water can be placed there so the cats have easy access. Once you note the comings and goings of the cats, you’ll know when to put the food out so it doesn't attract birds, possums, raccoons and other stray animals. If the cats' schedule doesn't match yours, try putting out food anyway they will find it and then adjust their schedule to yours. The feeding station should also be raised off the ground. Don’t forget; in the winter cats need more calories just to keep warm. If the bowls are emptied within fifteen minutes, put out a bit more food. A latecomer shouldn't find only empty bowls. Wet food is easier to digest, which means Kitty won’t spend warm-up calories on digestion. Try warming the canned food before taking it to the feeding station. 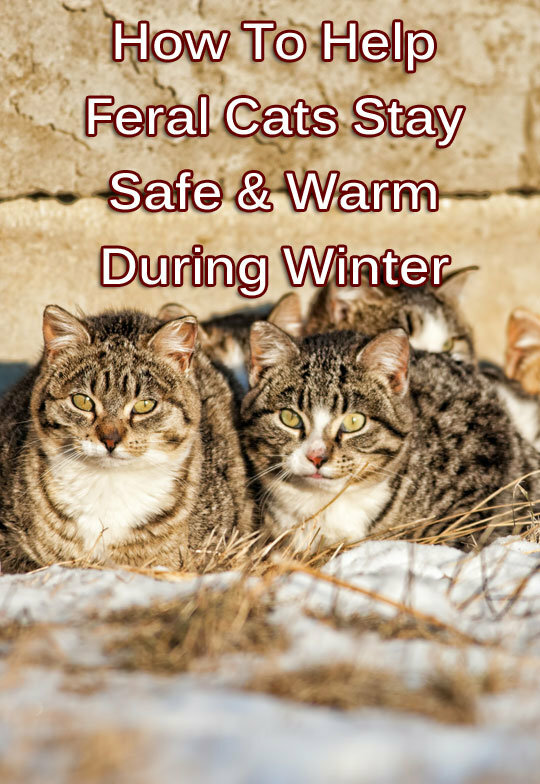 If you live far from the cat colony, consider heating up the food and storing it in a thermos during your drive. Insulate food bowls by setting one inside another to keep a layer of air between them. Spray insulation applied to the bottom of food bowls works too. If the weather is really bad, consider dry food only so there will be something Kitty can eat quickly. Don’t put water in the shelter. As the cats jostle for a comfy spot, the bowl can be turned over. Wet, cold bedding is worse than none at all. Check for heated water bowls at the pet supply store or change the bowls often so they aren't a block of ice when Kitty’s thirsty. Use deeper bowls instead of wide ones so it takes longer for the water to freeze. Refill with hot or warm water. Dark colored water bowls will absorb heat from the sun to keep the water liquid. Before starting the car, take a look at the top of the tiresis Kitty perched there? Bang on the hood in case she climbed up to get warm from the engine after you came home. Use only pet-friendly antifreeze and educate friends and neighbors. Antifreeze is sweet to the taste and deadly to cats and dogs. Clean up any spills at once. Shelters can get snowed in so when you shovel the walk, make a path for Kitty to get in and out. Clear areas where cats can hide, like under the porch, a bush or a likely hiding spot. Ice-melting salt is dangerous for pets. Rock salt can cut paw pads. Untreated cuts can become infected. Use only a pet-safe ice melt. 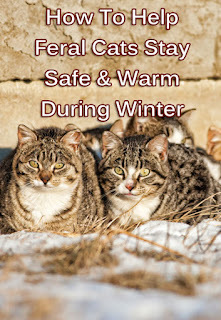 What Else to Do to Help Feral Cats? Trap, neuter, release works in the winter too. Don’t attempt this when there snow is on the ground or predicted. Wait for plus temperatures an open-mesh metal trap will expose Kitty to the elements and endanger his life if the weather is frigid or otherwise extreme. If the cat is a stray and not feral, try to coax him indoors. Contact a rescue group for help in finding him a home if he can’t stay with you. Remember, strays and ferals depend on the kindness of strangers. Help out all you can. Their lives depend on it.